Red hearts or sticky rice balls? 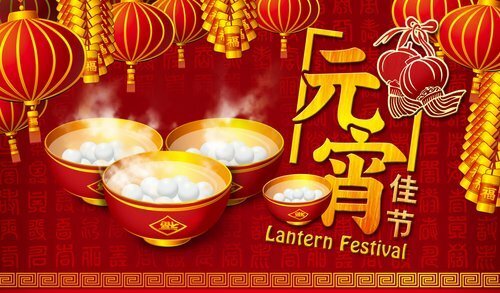 In any case, the Lantern festival a great excuse to hang up gorgeous Chinese lanterns and chow down on the Lantern festival’s most traditional food: 元宵 Yuánxiāo – sticky rice dumplings! Yup, today you can slurp down yummy 元宵 – delicious and round balls of sticky rice filled with a sweet filling of sesame (for instance – there also are savory kinds) that are served in a clear soup. These dumplings are also called 汤圆 Tāngyuán in some part of China. Use the festival for valentine day! And, if you’re pro-Valentine and want to celebrate both events, you can also simply use this festival for a fun Chinese-inspired Valentine Day! Family or love? A tough choice for some! For the Chinese, though, this double festival thing puts everybody in a hot pickle: do you celebrate the Lantern Festival – oh, only the second most important Chinese festival after the Chinese New Year – with your family, and slurp down delicious big round sticky rice balls or do you go out with your honey to celebrate your love? An option could be to invite your date home to partake in the family celebrations but that wouldn’t be the most romantic move, would it? Which would you choose? Love or family? Dumplings or chocolates?